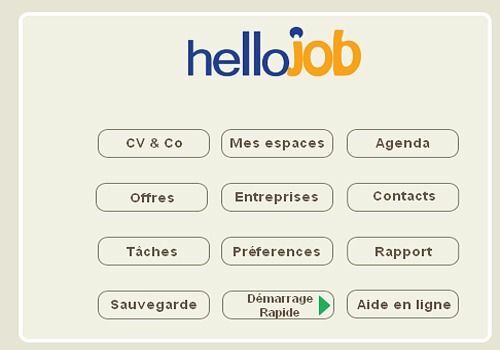 Hellojob allows you to synthesize all your job search activity in a structured database. Simple and easy to use, you can track your various actions on a daily basis, manage your agenda, tasks and emails. hellojob edits in a few seconds the report that tracks your activity over a given period of time. In this section, you can view your various CVs and cover letters in PDF format, prepare your presentation text in 3 minutes, make an audio recording, and also print a mini CV in business card format. In this section, you have access to most (over 100) job search sites. These are your spaces where you can store your passwords, search and save ads, view ads found through this space and perform some automatic searches. In this section, you can view the different offers you have selected from the job search sites and submit your application. In this section, you can view all your contacts, those related to a company, or those you enter directly in this section. You can also create an email correspondence for each of these contacts. Hellojob edits in a few seconds the report that tracks your activity over a given period of time. The next meeting with your advisor becomes detailed, reasoned and more fruitful. Anpsedic is a software for job seekers. It allows you to optimize your searches by keeping a record of each application sent and by managing reminders and the various steps to be taken. Easy Resume Creator Pro is a software that will be very useful if you are looking for a job. Indeed, it allows you to create a personalized CV and manage your application submissions. The text of the "EL Khomri" bill is available for download in PDF format. Currently being studied by the National Assembly, this text, already revised, is the subject of many challenges. Make up your mind now. EMPLOYMENT Follow-up allows you to follow your Applications and warns you of the Follow-up and Follow-up to be carried out according to a choice of number of follow-up actions and duration between each follow-up action. Job search assistance, creation of CVs and follow-up of applications sent. In a few clicks, find your complete file etc.